We provide you with the ability to edit the information in your user account information that you provided to us in registration by using your personal page configuration area. You may request deletion of your user account by contact us. By agreeing to the terms and conditions contained herein, you hereby allow www.Durianproperty.com.my to collect your Personal Information to be regulated and managed by company. 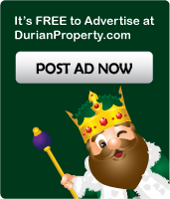 You also hereby agree to receive the latest information about products, news and events updates, rewards and promotions, special privileges and initiatives from DurianProperty.com.my, its partners and advertisers. If you have any questions about this Policy or our web site, please feel free to contact us at info@durianproperty.com.